In the late 1920's and 30’s, before the days of winter league baseball in South America, Major League players did a number of things to earn extra money in the off season. Even the great Babe Ruth, the game’s most prolific earner, was no exception. Ruth, his sidekick Lou Gehrig, and a number of other professional stars barnstormed throughout the country to the great pleasure of fans in towns without Major League franchises who may never otherwise witness their diamond exploits. These were largely profitable endeavors, and it is said that Lou Gehrig earned more money on these barnstorming trips than he was paid by the Yankees. Most of the barnstorming games ended early because there was such spectator pandemonium from fans rushing the field for an autograph or attempting to circle the bases alongside Ruth. Beginning in 1927 at the peak of the Yankees “Murder’s Row” dominance, the Ruth/Gehrig tour proved to be such a huge success that it was repeated directly after the 1928 and 1931 seasons. The 1931 tour saw these two baseball icons making an early appearance in Fort Lee, New Jersey on October 2nd, where one fortunate fan captured this unique 2.5” x 3.5” snapshot. The image pictures Ruth donning his “Universal All Stars” jersey and Gehrig wearing his classic Yankees road uniform and has been boldly autographed by each respective icon. This magnificent 85-year old keepsake is presented here in a PSA holder with a composite NM-MT 8 grade for the signatures. 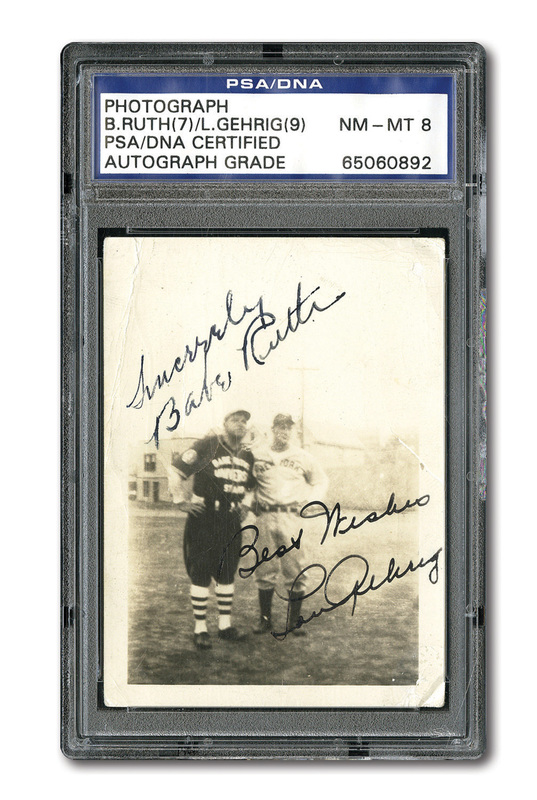 The bold Lou Gehrig autograph (“Best Wishes, Lou Gehrig”), has been individually graded a “Mint 9”, while the impressive “Sincerely, Babe Ruth” scripting has been rated a “Near-Mint 7”. Ruth/Gehrig dual signed photos are amongst the most coveted objects in the hobby and astute collectors are keenly aware of the exceptional rarity of non-personalized examples. 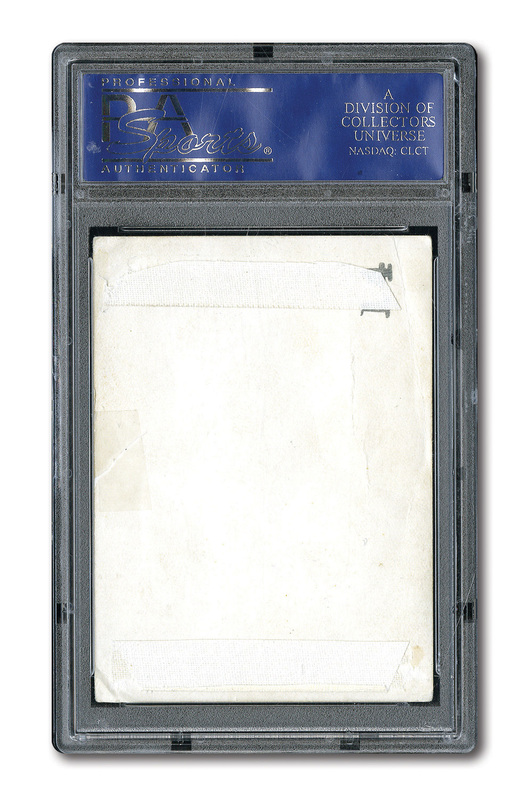 The snapshot shows scattered creasing and two vertical bands of tape on reverse from previous mounting, however, the character and presentation quality are exceptional. PSA Authenticated/Encapsulated (NM-MT 8 autograph average).